Here at Depiction, we strive to help others expand their web design knowledge. Our goal is to help you develop aesthetically pleasing and user friendly websites with your own creative touch. Depiction, the representation through picture or words, was chosen for this site because it presents a professional image and well suits a web design resource and learning site. I have created and maintained many websites over the past few years covering web design and personal hobbies with many uncreative names which have badly represented me. Taking the time to pick a well suited name was very important this time around. Depiction opened in June 2003 with a wide variety of content. Although there were very few tutorials here, we had many games, downloads, scripts, virus info, and free templates; much of which was free content hosted elsewhere. 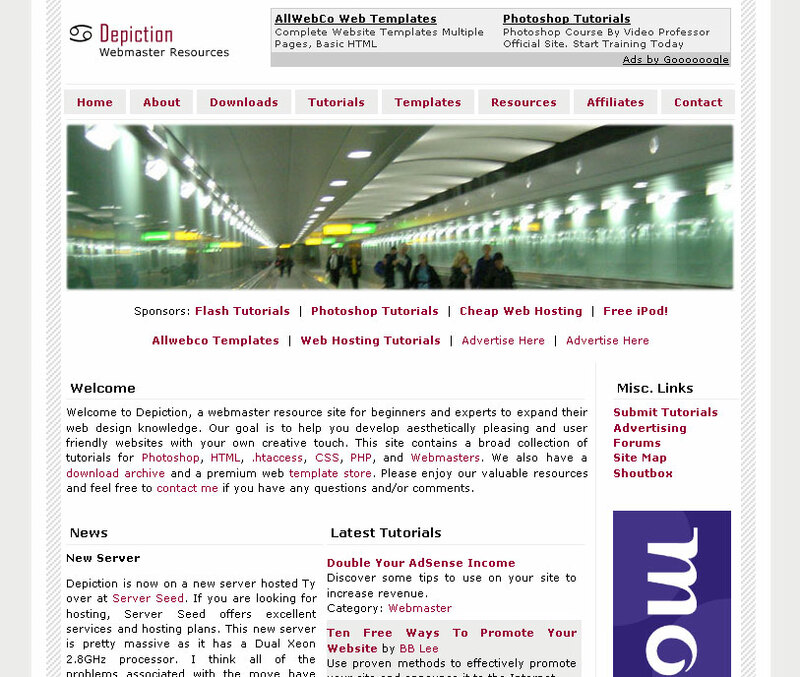 In August 2003, InterSolutions, the paid web design and hosting service section of the site, opened with little success. Although I don't receive regular clients, InterSolutions is still open; mainly as a portfolio site. With the desire to help others more and increase the visitor base, version 2 was launched in September 2003, with more tutorials. Depiction began to grow rapidly with the addition of numerous Photoshop tutorials. During this release, links to Depiction's tutorials began appearing on Photoshop tutorial databases, such as Good-Tutorials. 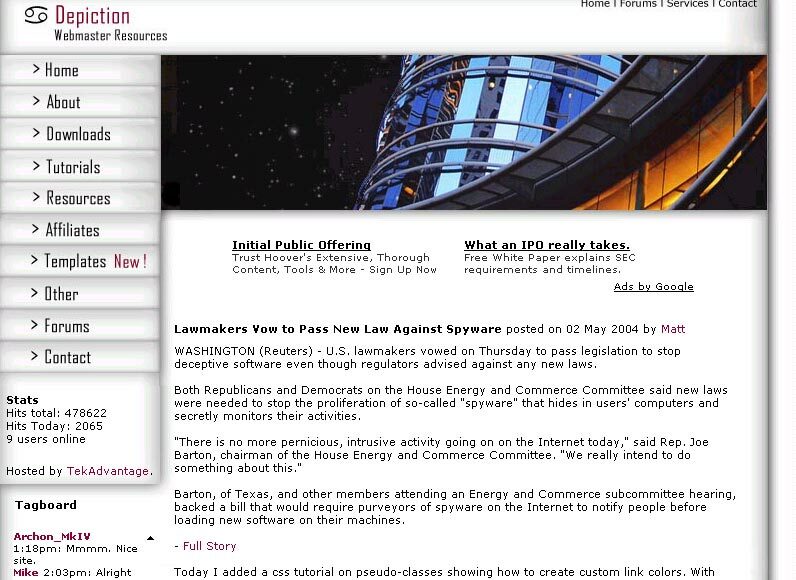 To keep up with new web standards, version 4 was released in June 2004 with a faster loading design. 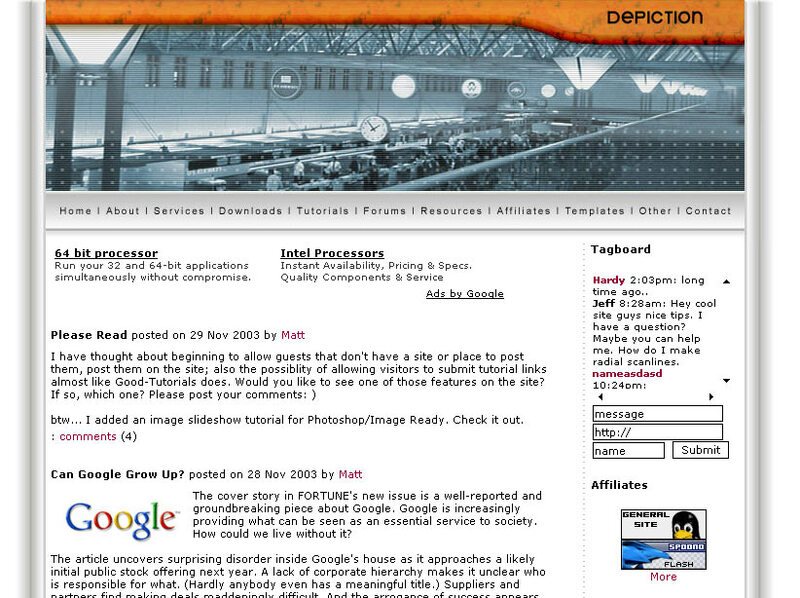 This was the first tableless layout using CSS and XHTML, which made design changes more efficient. In May 2005, version 5 was launched to refresh the site and draw more color in. The most noticeable addition is the new RSS feeds that allow visitors to track and read RSS feeds from some of the most popular web development related websites directly by visiting Depiction. With over 2,500 unique visitors per day, Depiction has a bright future.